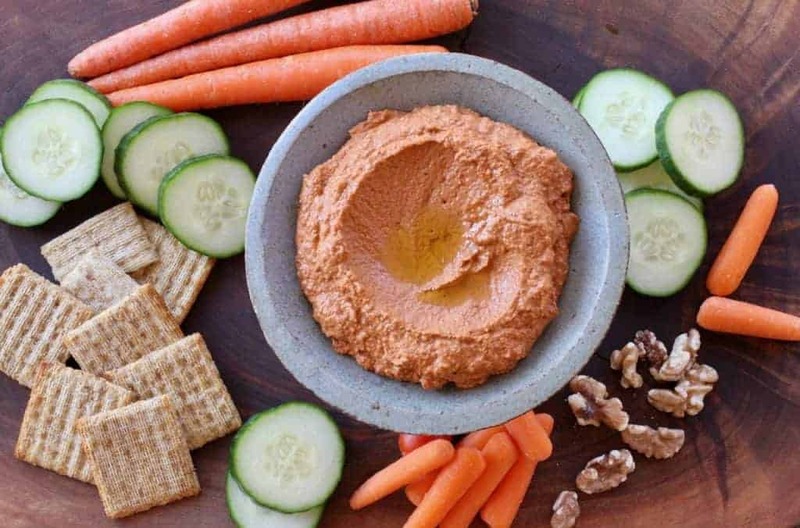 Tangy with a bit of spice, Red Pepper Walnut Dip is a scoop-worthy recipe! 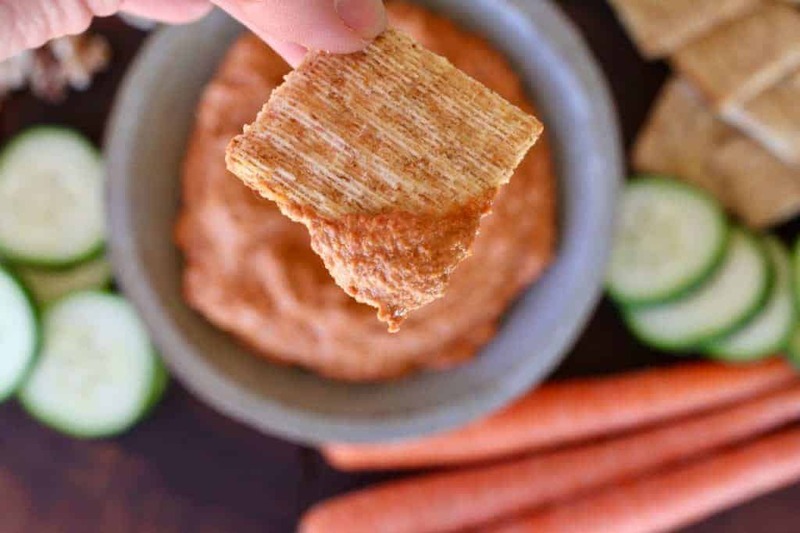 Toss it, spread it, dollop it, this roasted red pepper, vegetarian dip is simply healthy food. When I scored a .99 bag of wilted sweet red bell peppers, I knew exactly what I was going to make. Muhammara. A middle eastern dip. This tangy, walnut and pepper dip requires roasted peppers so a few dings and bruises made no difference to me. Red peppers are riper, sweeter and generally more expensive than the younger green peppers. They also spoil faster because they are farther along in the ripening process. They can be stored in the fridge for up to a week. 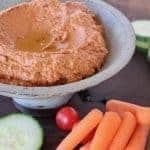 Together, the ingredients in this recipe make a delicious dip plus they are a good health investment. Sweet red peppers star in this dip. But that’s not all. They contribute vitamins C and A and that bright red color means more anti-inflammatory from the plant chemicals help in preventing cancer. Peppers are on the lower end of the potassium scale, making them a better choice for people with kidney disease. (Though this recipe has walnuts, a high potassium food, so this dip may not be ideal for those watching potassium levels). Walnuts thicken the dip and provide protein, fiber, potassium, and fat. This is a better-for-you fat, the plant-based version of omega 3’s that contribute to heart health and reduction of chronic inflammation. Spices in this recipe contribute great flavor plus anti inflammatory benefits. I used smoked paprika but you can substitute regular paprika, or none at all. If you want a gluten free option, replace the bread crumbs with rice crackers or gluten-free bread. To roast peppers, set the peppers directly on the grill. Roast until skin is puffed, blistered and blackened, turn peppers during roasting so all sides are roasted. Remove from heat, immediately place in a large bowl and cover with plastic wrap. Allow to cool at least 15 minutes. This creates steam which allows the peppers to be peeled easily. 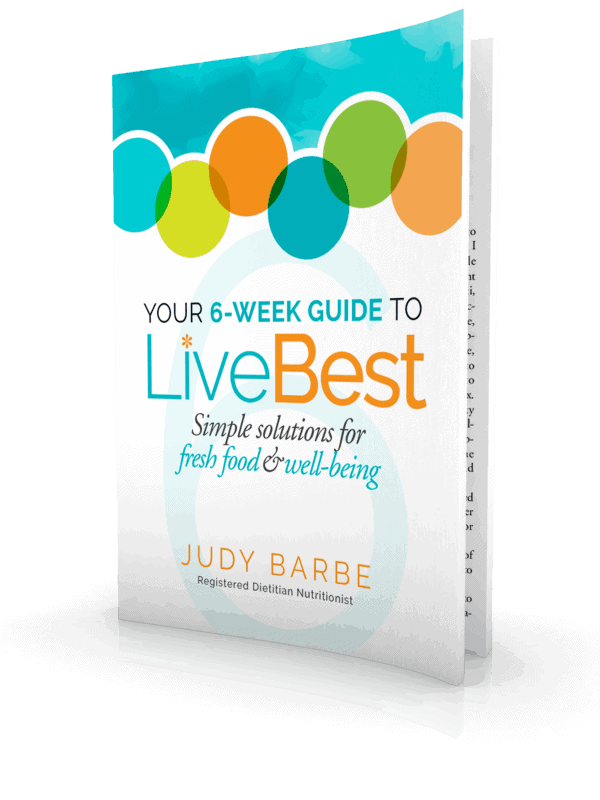 Remove peppers from bowl, peel off charred skin, remove stem and seeds. Alternatively, the peppers can be broiled in the oven. Place the peppers on a baking sheet, broil, turning regularly until blackened. To save time, roast the peppers while you are grilling other foods. After roasting, they may be store in the fridge for a couple days, or can even be frozen for a few months, before you make the dip. Jarred roasted red peppers work in this recipe too. 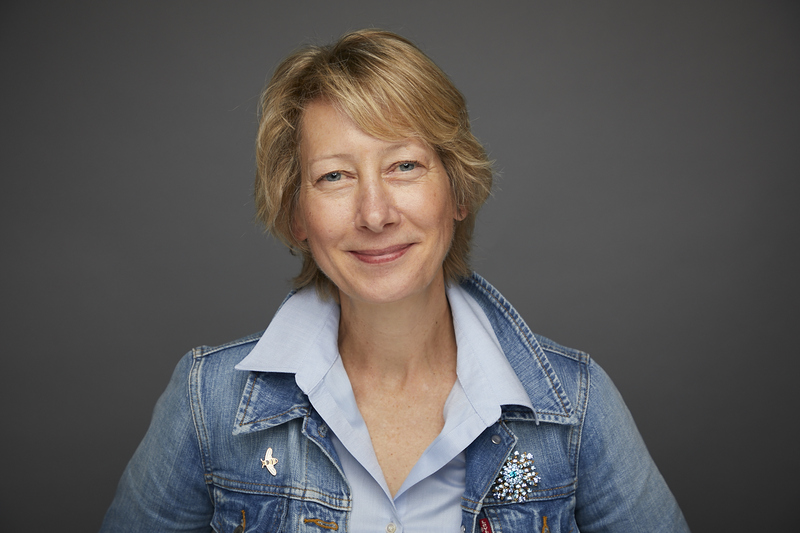 Do you improve with age? 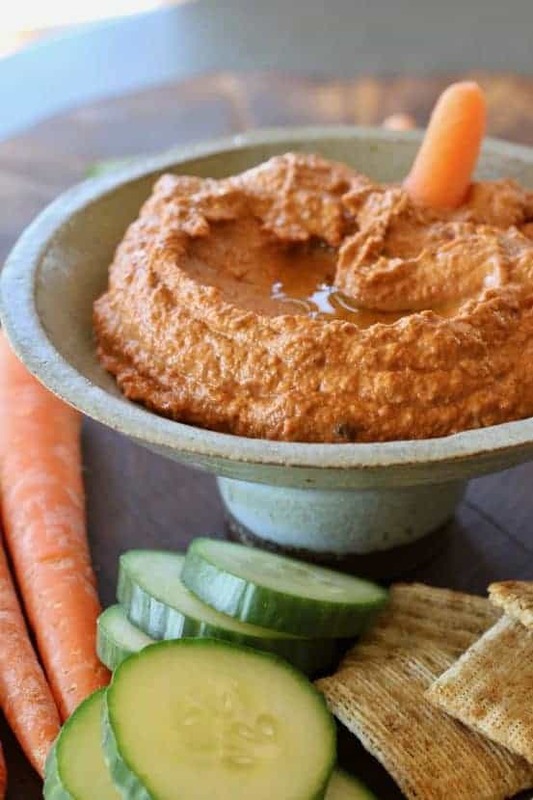 Red Pepper and Walnut dip does! Flavors develop as it ages, so if you can make it a day or two ahead, it’s even better. Find some cute lil dip bowls on Etsy. Let me know what you think, please. Leave a comment or rate the recipe.